Are you considering starting a blog on your event planning website? If you are looking for good reasons to start a blog, you are in the right place. According to TechClient, “61% of shoppers made purchases based on a blog post”. TechClient goes on to say that websites with blogs have 434% more indexed pages than websites without blogs. This is huge. What does all of this mean? How can this information benefit your event planning business? I’m going to give you five reasons why you should have a blog on your event planning website. But before I get started with the five reasons, I’d like to share my own personal experience with reading blogs and how my life has been impacted, just so you can see firsthand the power of having a blog. Preston Bailey has earned a space in my heart as one of my favorite celebrity event designers. By far, I consider him the King of luxury event design. Though I have never personally attended any of his events, he earned that space through the blog on his website. I was impressed with the content, and the level of openness Mr. Bailey shared on his blogs, (like him sharing how he went almost 2 million dollars in debt after several business mistakes) that I became a fan. Just from reading his blogs I felt like I connected with him and his personality. This is exactly what you want to do with your blog also. You want to share valuable information from everything you know about planning events and weddings. I recall a time when I had concerns about being on the right track with my event planning business. I wondered if some of my practices were on point, like my decision to charge a retainer fee that amounted to 50% of the total cost of the event. My concerns were put at ease from reading another planner’s blog that this was a standard industry practice. You may be wondering how do you come up with enough topics to keep your blog going? I have some great advice for this – think about the top 5 or 10 most common questions you get asked about events. Write those down. Now you have 5 – 10 articles you can write about just like that. If people have asked you a question about events before, then other potential clients have the same questions and are Googling around for the answers to them. Take these blog post topics you just wrote out and write blog posts of 250 – 1000 words covering the details of these questions. Over time, as people read your blog they will view you as an expert of your field. Simply put, the content on your blog will eventually lead to people to your website and the services that you offer. Here are the 5 P’s of why you should start a blog: Presence, Personality, Professional knowledge, Passion, Potential Revenue. 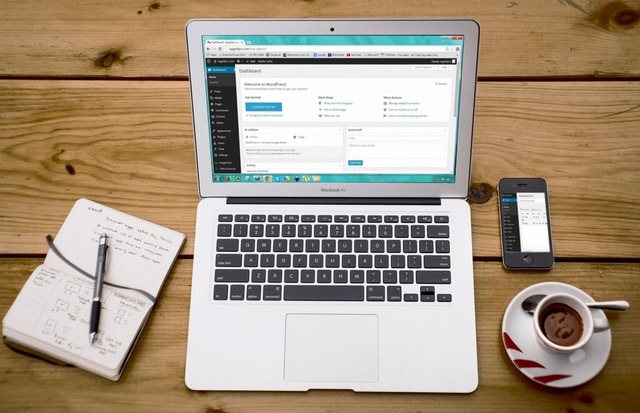 These five P’s equate to 5 reason why you should have a blog on your website. Maintaining an online presence is crucial to your business. Staying top of mind is just as important to your event planning career, as it is for celebrities and their careers. As you may have experienced in our recent culture, it’s the celebrities who have the ability to drive people to their online presence who are the most successful professionally – they’ve learned how to create a buzz for themselves. It’s the same with utilizing a blog as an event planner. Through the content of your blog, you create a reason for people to keep coming back to visit your page. Unless you have paid to have your website placed in the top of Google and other popular search engines, it would probably be fair to say that no one is bombarding your website with visits. However, the sweet thing about having a blog on your site is that with every article you post, you increase the chances of someone stumbling across your webpage. By typing certain keywords in the search engine regarding event planning, your article pops up in the search results by keywords used in your article, which in turn, will drive traffic to your site. This site gets a lot of it’s traffic through the informative blog posts written on the site. After you read this article you can read through some of our other posts to see the informational style we use. You can do the same by answering the most common questions your clients have for you in your blog posts. Having a blog on your website gives readers an intimate glimpse into your personality. The reality check that most people find when entering into the event planning field is that event planners come a dime a dozen. My grandma always used the “dime a dozen” phrase to express the concept of supply and demand. There’s a large supply of event planners, but not as large demand for us. You don’t find the want ads filled with pages of “event planners” needed. Usually, we have to convince the client as to why they should hire us in our sales pitch. In some cases, depending upon where you live, your area can be saturated with event planners. Where I live, everyone and their third cousin claims to be an event planner. Now, we all know of course that the skill level and talent varies, and you get what you pay for. However, you still need something that will set you apart from other planners. Years ago, when I sold insurance in a heavily saturated area of other insurance agents, I received valuable advice from a woman who was very successful at selling insurance. She told me, ‘don’t sell the insurance product, sell yourself.’ What she meant was, sell your personality. Though there may be many agents, there was only ONE me. There is only ONE you, express your uniqueness in your blog. You will find in this industry that you can be the greatest planner, but if the client does not connect with your personality, or misunderstands your personality, you will not close the deal. Yet, by having a blog, potential clients get to learn more about you and your style and who you are as a person. Your blog and the quality of the content that you provide is what will set you apart from other planners. A blog gives you the opportunity to set yourself apart as an expert in the field. By sharing valuable industry knowledge, and providing solutions to common event problems, you will build professional credibility with your readers. Your followership will see that you are capable of managing their event should they need you to do so. Having a blog also allows you to educate your readers on what to expect when hiring an event planner. Or instead of waiting for your elevator pitch, use your blog as the platform to explain to readers why they should hire an event planner. Your knowledge builds consumer confidence. People who have passion for what they do usually do it best. Your blog is your chance to show your readers that if they hire you, they are getting the best. Your passion for planning the perfect event will show through the content that you write for your blog. Be exceptional when creating the content to your blog. Allow your passion for the event industry to cause you to throw everything within you onto the pages of the articles that you post. Remember, your blog reflects you, and your blog is what will set your apart from other planners. As stated early, statistics shows that a large number of buyers tend to make purchases based on blog post. This is mainly because, the potential buyer has received something of value from your blog. One way to increase the potential of a reader becoming a customer is creating value added incentives and offers that you provide that will get the client to respond to a call to action. Blogs also offer additional ways to generate revenue through paid ads. If your blog has a high readership, some advertisers will pay you to advertise on your blog. Pay per click or cost per click is a very popular way companies advertise, by placing banners in the content or on the sidebar of your blog post. You may end up choosing not to accept advertisers on your blog and just use it as a tool to get clients but at least the option will be available to you. Having a blog is different from publishing post on Facebook, Instagram and other social networks. The advantage is that you can add meatier content. As you know with most social media network sites, the more words people see posted, the more likely they are going to scroll past the post and not read it. People want to see funny pictures and short memes on social media. With a blog, people come just for the purpose of reading all of the brilliance that you have to offer. Lastly, don’t be intimidated. Adding a blog to your website is not hard. Most websites come with a blog tab already available. Do you have a blog? When you create your blog what are some topics you wish to write about. Perhaps you can list the topics in the comment section, and we as a community can offer jewels for you to add to your content to help you get going on your first article. If you found this article helpful please share it on Facebook or Pinterest. Love these reasons! All true and motivated me to get started. I’m writing out topics for my first posts. Informative post. We are planning to organise our corporate annual events. We are looking for an Event Organiser. Some have suggested about The Bandit Production. We are planning to consult them. Want to talk about decor.. Good reasons to hire a planner…what styles.themes are popular..